Since the 1980s, economic success in Asia has often relied on foreign investment, at least initially. Last week, President Duterte took a decisive step toward that direction. Why has the change taken so long? And why is the devil in the details? In the third quarter, the Philippine economy grew 6.9%, which made it Asia’s second fastest-growing economy after Vietnam. But unlike Vietnam, which has reaped many benefits of foreign direct investment (FDI), the Philippines has not. Again and again, former President Benigno Aquino III acknowledged the need to boost FDI during his reign. Yet, the main challenge to attract FDI has been the 60/40 foreign ownership law, which Aquino neglected to confront between 2010 and 2016. On November 21 President Duterte ordered the National Economic Development Authority (NEDA) to take “immediate steps” to lift or ease restrictions on foreign direct investment (FDI) in the Philippines to foster economic growth. As I have argued for years – on the basis of my work in competitiveness, innovation and FDI in several continents – a change is desperately needed in the Philippines. And it is about three decades late. While FDI stock illustrates the size of foreign investment historically, FDI flows exemplify the size of recent investments. In the years of booming globalization, FDi stock as percentage of GDP increased slowly in the Philippines, but more than doubled in Indonesia and almost quadrupled in Thailand - until global FDI plunged during the global financial crisis in 2008. True, FDI flows in the Philippines more than doubled to $5.7 billion in 2013-14, but only to plunge to $4.9 billion in 2015 toward the end of the Aquino era. These flows should be set in the historical context: In the early 2010s – when Aquino promised to attract far more investment to the Philippines – FDI as a percentage of GDP actually declined to 12.4%. This figure was only half of that in Indonesia, barely a fourth of its counterpart in Thailand and a fifth of the regional average. During the past decade, Singapore has remained Southeast Asia’s leader in inward FDI flows, which peaked at $74 billion in 2014. More recently, the FDI performance of both Indonesia and Thailand has eroded significantly. In turn, the weaker FDI players – Myanmar, Cambodia, Laos and Brunei – continue to generate about $1 billion to $2 billion annually. 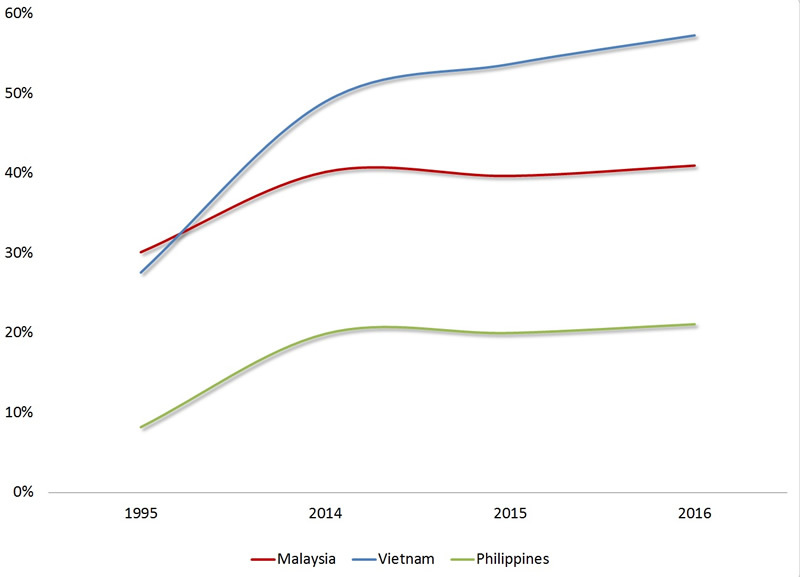 Consequently, Malaysia, Vietnam and the Philippines are now competing FDI flows in the same category. In the early 2010s, Malaysia was the leader with some $12 billion in FDI flows. Currently, Vietnam has the mantle with almost $13 billion, but – in the Duterte era – FDI flows to the Philippines grew to almost $8 billion last year and there is potential for far more (Figure 1). In historical view, the picture is worse because, unlike its more successful ASEAN peers, the Philippines has failed to benefit from inward FDI for decades. In the 1990s, FDI stock as percentage of the GDP was more than 30% in Malaysia, close to 28% in Vietnam but only 8% in the Philippines. By 2016, the ratio had soared to 57% in Vietnam, while climbing to 41% in Malaysia. In the Philippines, it was 20% - while remaining stagnant through much of the Aquino era (Figure 2). The good news is that the change in FDI flows has come with the Duterte era. The bad news is that it has been preceded by three decades of missed opportunities. But how should the Philippines attract FDI? The bottom line is that FDI flows should enhance Philippine competitiveness over time. Otherwise, foreign investment may benefit foreign companies and their investors – but not Philippine living standards. In the Global Competitiveness Index, the Philippines is today ranked 56th, right after Vietnam. In the Corruption Perception Index, the country (101st) is ahead of Vietnam (113th). But here’s the real challenge: Despite impressive growth performance, the Philippines (113th) remains far behind Vietnam (68th) in the Ease of Doing Business rankings, along with Malawi, Swaziland, and Palestine. That's unconscionable. The Philippines needs substantial structural reforms to unleash entrepreneurship. But how should the Duterte government use FDI to upgrade competitiveness? First of all, the objective should not be to attract investors with subsidized input costs, but with higher productivity. For instance, subsidizing electricity rates may offer private gains for investors, but improving the efficiency and quality of the electricity grid would support the productivity of the entire business environment. Second, the goal should not be to improve the quality of the location in ways that benefit just investors, but multiple companies and industries. For instance, tariff exemptions generate market distortions, whereas improved customs procedures enhance national competitiveness. Third, it is vital to develop “sticky” incentives that are tied to the location. Corporate tax breaks boosts the “race to the bottom,”’ whereas general improvements in the business environment contribute to the country’s attractiveness. Fourth, focus should be on sustained investment rather than transient one-time deals. If incentives are tied to the total size of the investment, they will be more beneficial to the country (and to the investors). Indeed, the government’s “Build, Build, Build” infrastructure plan is one vital instrument in this regard. Similarly, incentives that encourage profitability and motivate investors to upgrade activities in the country contribute to more sustained FDI. Indeed, boosting FDI flows should be linked with efforts to enhance innovation in strategic clusters that will be vital in the future as the Philippines competitiveness is enhanced and upgraded. Nevertheless, increased foreign investment is no panacea, as labor and nationalist leaders often argue. If FDI flows rise at the cost of the country’s long-term productivity and economic development, nation's sovereignty will be penalized. Furthermore, without appropriate efforts at the long-term "indigenization" of foreign investment, FDI benefits are likely to prove transient. In much of emerging Asia, including China, national leaders did not opt for the FDI as a way to enhance productivity because it was the best option, but because alternatives were worse. Second, the countries that have truly benefited from FDI are ones that have excelled in "learning by doing." Initially, foreign multinationals arrived with their own eco-systems; over time, foreign suppliers were replaced by cost-effective indigenous contractors. Third, as China's success has demonstrated, assembly manufacturing, coupled with unleashed entrepreneurship, can make a great difference in economic development because it opens the benefits of industrialization to many. Even currently favorable “demographic sweet spots” will only prove tomorrow’s development traps unless jobs are available, under-employment is marginal and the best and the most industrious are not being exported to other countries. Moreover, significant FDI flows are necessary but not enough in countries in which manufacturing lacks adequate presence and in which landed elites are reluctant to renounce historical privileges – even in the name of their children or grandchildren. Undoubtedly, the Duterte government is now paving way to recapture some of the FDI flows of the missed decades. Yet, the magnitude of the challenges should be taken seriously. What the Philippines needs is inclusive foreign investment, which requires a long-term focus on economic development.